Over more than a quarter-century, from 1986 till the time of writing, the Chinese American Medical Society (CAMS) has had the good fortune of being managed by an Executive Director of almost unbelievable energy and drive, and wide experience in the matters of CAMS, Dr. Hsueh Hwa Wang. Dr. Wang was born in Beijing, attended the National Central University Medical School in Chengtu and graduated in 1946. She came to New York City soon after, had some post-graduate training, then joined the Dept. of Pharmacology at the College of Physicians and Surgeons of Columbia University, where she rose to the rank of Professor. Her research was in the field of physiology and pharmacology of the coronary circulation. From 1985 to 1990 she was the Director of Graduate Studies in the Department. At the same time, Dr. Wang was active in CAMS, becoming President in 1982, and accepting the unpaid position of Executive Director in 1986. After her retirement from Columbia, she was able to devote much of her free time to CAMS. With a history going back to incorporation in 1964, CAMS has had a tradition of full-day annual scientific meetings, fund-raising dinners for scholarships for medical students, dinner meetings with medical speakers, and other activities that bolster a spirit of camaraderie among its members. It has formed strong ties to the Chinese American Independent Practice Association (CAIPA), founded in 1994 by Dr. George Liu in response to the relentless spread of managed care. The establishment of CAIPA has injected a strong dose of the realities of the new practice model into the more academic CAMS. At the same time that CAMS was growing its Annual Scientific Meeting, the Staff of the Chinese Hospital in San Francisco started their biennial scientific meetings in 1982, and named it International Conference on Health Problems Related to the Chinese in North America. In 1986, the 3rd of these conferences was sponsored by CAMS under the leadership of Dr. Wang. She was also one of the prime organizers for CAMS to host the 7th (1994), the 11th (2002), and the 13th (2006) Health Conferences. The major medical association with an over-arching role is the Federation of Chinese American and Chinese Canadian Medical Societies (FCMS). It had its inauguration in New York City in 1994, during the 7th International Conference, and was the brain-child of Dr. David Chiu. FCMS started with 10 society members, from the USA and from Canada, and a total of over 2,000 individual members. By this stroke, a greatly enlarged membership could now exert its medical and political strength. Dr. Wang was the President of FCMS in 2000, and Chairman of the Board in 2002. Dr. Wang was also involved in the inception and organization of the FCMS Foundation in 2003. This is a section 501 (c) (3) entity that provides fund development function. Dr. David Chiu is the current President and Dr. Wang the Secretary-Treasurer. In 2011, Dr. Wang received a Lifetime Achievement Award from CAMS, honoring her 25 years of meritorious service and leadership as Executive Director. In early 2012, she was asked to be the Chairman of the Committee charged with producing a book commemorating the 50-Year History of CAMS. To complete Dr. Wang’s essential biography, her husband of 50 years, Dr. Shih-hsun Ngai, died in 1999. Dr. Ngai was Chairman of Anesthesiology at Columbia University’s Presbyterian Hospital and member of Academica Sinica in the Republic of China. 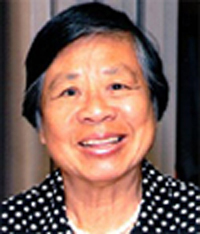 She has 3 children, Mae M. Ngai, Ph.D., the Lung Family Professor of Asian American Studies and Professor of History, Columbia University, Janet Ngai, physical therapist in Nelson County, VA, and John Ngai, Ph.D., the Coats Family Professor of Neurosciences, UC Berkeley; 5 grand-children and 1 great-grand son.